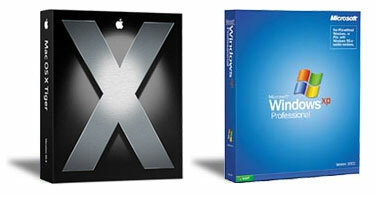 Posted by paralleldivergence in apple, Brad & Phil, mac vs windows, windows. We’ve all seen the ads. “Hello, I’m a Mac”, “And I’m a PC”. If not, go here. I can’t think of any other TV advertising campaign that has a running series spanning fifteen different ads over such a short period of time. Sure, we did have the old Pepsi vs Coke Taste Test ads – the ‘Pepsi Challenge’, and this very clever one, but they don’t go anywhere near highlighting so many differences between two directly competing products as the Apple campaign does. One thing the Mac vs PC and Pepsi vs Coke ads have in common is that in both cases, it’s the underdog taking up the challenge to their respective runaway market leader. In the case of Apple, worldwide we have the less than 4% market share company against the 94% share held by Microsoft. The other 2% are held by the various flavours of Linux. These updated daily figures come from the respected W3Counter site and are based on, at last count, 4.3 million distinct visits to 2900 websites by computers across the globe. It’s probably as transparent and accurate as anyone can get. So, are the Apple ads working? It really depends on who they are targeting and I’m yet to figure that one out as well as determining the real aim of the ads. Are they aiming to increase sales? I keep hearing about Intel Macs “flying” out the door of Apple Centres, but the W3Counter figures are yet to show any visible sign of a spike despite the ads being around for several months. If the aim is to annoy Windows users, I believe they certainly are doing that. Which of the two guys in the ad would you categorise as the “bully” and which as the “nerd” in the schoolyard? If the aim is to educate people about the real benefits of a Mac, the personification of computers has probably missed the mark. Talking about iLife ’06 pales compared to demonstrating it. Finally, if the aim was to entertain and make people laugh, well done Apple, it works! But it’s expensive comedy. As for me, yes, I bought a 20″ Intel iMac this year and I think it’s great, but I still use XP more. I didn’t get my Mac because of the ads, I got it because of Final Cut Pro Studio. I needed a Mac because I needed the software that only comes on that computer. Just like some people need a PC because the database or the CRM or accounting system or more importantly for some, the games they use are only developed for Windows. Remember, it’s not Microsoft that’s “selling” Windows to the userbase, it’s the users buying it because of a legacy need. Seriously, the best thing Apple did for the iPod was bring out iTunes for Windows. As for Brad & Phil, they’re just two of the large percentage of TV viewers that have no clue about computers whatsoever. What do you think of the ads? Given the relative market shares Apple could double its share by taking only 5% of Microsoft’s 94%. However I suspect the adds are preaching to the already converted. Why would anyone switch to a company whose adds make fun of you. Some of the spoof ads also have a Linux guy. cyber_rigger, you mean this spoof ad? I generally agree with your sentiments Stu. Apple still have a problem with hubris and it shows in these ads, but yes they ARE very funny! and have one for each of the 5 (6) iLife apps (6 counting Comic Life)? Do people even know what iLife is? Do people know that it is free with a hardware purchase? And only $60 edu? Most Windows users I have spoken to have no idea it exists, and even fewer have tried it. Nothing in the Windows world comes near it. Do people know how well the iLife apps work together? Do users of Acid Xpress know what they are missing out on with Garageband? or that iMovie supports HD? or that (despite it’s limitations) iWeb is just about the easiest way to publish online? Yes come on Apple tell the world! As for me I used to work in a Windows only environment (glad to be back in a cross-platform one) and I currently run 3 different OSs on my MacBook Pro. Apple still make the best OS and their hardware is “good enough”. I’ll continue to use and promote the advantages of Macs because they are easier to set up, are (still) easier to use, break down less often, are easier to support (ie cheaper), have plenty of software (especially the stuff I use), are free of viruses and other malware (so far) and are cheaper to buy and maintain in the long term. One problem with Final Cut Studio though Stu – the full install is 30+ gig!! That’s a quarter of the hd on my laptop! One weird thing is that Apple flogs the iPod but has 80+ something % market share. Another weird thing is that it’s not the best MP3 player! Success has nothing to do with quality….. Same with operating systems I guess. Great post Chris. As for Final Cut Pro, I know it’s huge. It took four hours for me to install! Apple really do have to “sell” iLife ’06 a lot better than they have been. Funny ads are great for selling beer, but I’m not sure they work for a relatively big investment like a computer. The ads are clever – like most of Apple’s ads. Compare them to the boring Microsoft draw-over ads. Or the other colourful Microsoft soccer and music ads that basically seem to encourage piracy and promote 3rd party multimedia software that doesn’t really exist for the PC. But I think that the ads are unlikely to increase market share a great deal. If their funstion is to make Apple users feel smug, the they do it well. When I was Mac user I loved that feeling of superiority. The ads are a bit like the famous 1985 “Lemmings” ad that apparently wasn’t any great success. They are insulting the very people that they are trying attract. Would anyone want to say they’ve been a fool buying a PC and then get a Mac? Having said that, I’ve had a few people ask me about the virus-free claims for the Mac. That part seems to have really caught people’s attention. The last few days have seen some discussion on Learning Advisors and the use of technology. Listed below is the URL of Corpus Christie which is located in one of the suburbs of Wollongong. One might be able to gain some slight insights? strategy for “learning spaces” and the use of technology. I accept that this pedogodgy is terrific for students in Year 7 – 10. It seems to me that the teachers are “general type” teachers and can get away with not knowing specifics within courses. However, somewhere along the education continum within NSW, I adovate that Learning Advisors have to become more specialised to do the students justice for the HSC courses. I have met young teachers who have worked in schools just starting up. The one example I clearly remember was that he was teaching HSC Biology, HSC Geography and HSC Computing Studies. The workload certainly had impact upon his mental state for that year. If a student’s goal is to go onto university, generally speaking I just can’t see how a Learning Advisor’s generalist’s strategy will be very helpful in obtaining a band 6 in any given subject. We strive for band 5 or band 6 to increase the students chances for being accepted into the Uni system. Hence, parallel divergence may apply with Learning Advisors and technology. Here’s an analysis from an ex-Apple employee. From my experience this is a very valid point, having known IT managers who promote the PC knowing that Macs are cheaper to support. Thanks for the ad analysis link. It’s another viewpoint, but in terms of being a truly effective ad campaign (converting into more Apple sales), I’m yet to see it happening. It is truly clever, but as Rod Smyth said here, it seems more like preaching to the converted. I agree there are many CIOs that rollout flawed arguments when justifying why they can’t and won’t go Mac, but again, as you paraphrased, “Winertia” has a lot to do with it. Just another thought: The ads talk about Macs vs PCs. But Macs are just PCs with a different operating system. The PC man’s apparent problems would all solved if he just uninstalled Windows and installed Mac OSX. At the the moment he can’t – but perhaps one day he will be able to. Softening up the PC market for the day that they will version OSX for the rest of the market. just to name a couple of sources. Apple make their money from hardware so they don’t admit to this. lol, i loved the pepsiVScoke to appleVSmicrosoft comparisn. those ads are soo old! ^^ totally forgot about them too.